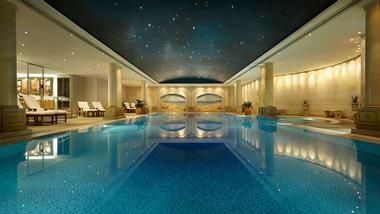 The Langham, Sydney is a luxurious hotel with breathtaking harbor views. Located in the vibrant Rocks district of Sydney, the elegant hotel is surrounded by quaint cobbled streets and beautiful historic buildings and offers a tranquil escape from the hustle and bustle of the city. 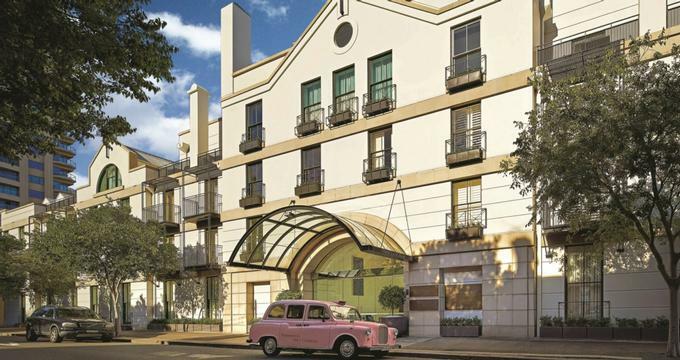 Elegant and refined and exuding the timeless grace of a bygone era, the Langham features 98 sophisticated guest rooms and suites with contemporary décor and stylish furnishings, spacious living and dining areas, kitchenettes and private balconies and modern amenities. 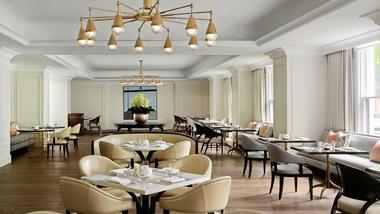 The Langham has a chic restaurant with modern European fare, as well as an elegant tearoom and cocktail bar, an exclusive high-end spa, and a fully equipped fitness center. A heated indoor swimming pool and tennis court offer a relaxing option for keeping fit, while new meeting and event spaces are available leisure and corporate functions. The Langham is ideally located as a base for exploring the city and is within a few kilometers of the Sydney Opera House and the Queen Victoria Building. 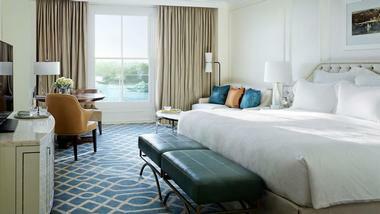 The Langham features 98 sophisticated guest rooms and suites with contemporary décor and spectacular city views. Every guest room is a haven of tranquility with soft paneled walls, high ceilings, and plush, bespoke furnishings, while suites have spacious living and dining areas, and fully-equipped kitchenettes. 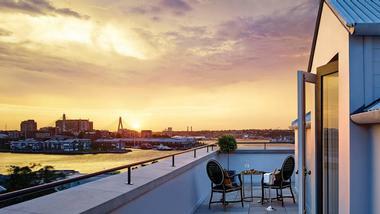 All rooms enjoy private terraces with iconic views of the Sydney cityscape and bustling harbor. Modern amenities in every room include cable televisions, fully-stocked fridges, Espresso machines with coffee and tea facilities, irons and ironing boards, and complimentary wireless Internet. Complimentary international newspapers are available upon request. Deluxe Rooms are 527 square feet in size and feature king-size or double beds in designer linens, private marble bathrooms with enclosed showers, large bathtubs, plush bathrobes and towels and deluxe bath products. Walls are adorned with artworks from local artists and private balconies and terraces boast beautiful views of Western Harbor and the city. Terrace Rooms range from 527 to 840 square feet in size and feature king-size beds in designer linens, private marble bathrooms with enclosed showers, large bathtubs, plush bathrobes and towels and towels and deluxe bath products. These rooms feature bespoke furnishings and high ceilings and have signature balconies and terraces with iconic views of the Sydney cityscape. Junior Suites are 624 square feet in size and feature king-size beds with designer linens, private marble bathrooms with enclosed showers, large bathtubs, plush bathrobes and towels and deluxe bath products. These rooms feature bespoke furnishings and high ceilings and have signature balconies and terraces with iconic views of the Sydney cityscape. 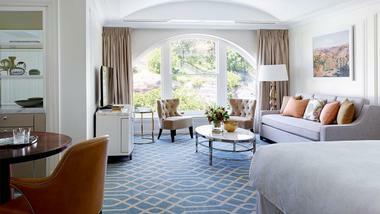 One Bedroom Suites are 840 square feet in size and boast breathtaking views of the bustling Sydney harbor. Suites feature separate sitting areas with wood-paneled walls, high dome ceilings, and bespoke furnishings, as well as spacious king bedrooms and en-suite marble bathrooms with an enclosed shower, large bathtub, plush bathrobes and towels and deluxe bath products. One Bedroom Suites have private balconies and terraces with comfortable seating to enjoy the views. The Residence is a luxurious, spacious two bedroom, two bathroom suite with 1184 square feet of space and king-size beds in designer linens. A private marble bathroom has an enclosed shower, large bathtubs, plush bathrobes and towels and deluxe bath products, and the suite features a formal dining area and a modern kitchenette. The Residence boasts beautiful Western Harbour and Sydney skyline view. The Observatory Suite is a study in glamor and luxury with 1313 square feet space and majestic views of Observatory Hill and the Sydney skyline. The Suite has a double drawing room with a stately functional fireplace, a king-size master bedroom with king-size bed and a marble en-suite bathroom with an enclosed shower, large bathtub, plush bathrobes and towels and deluxe bath products. The suite also features a grand dining room with a table that seats eight guests and a private wine cellar. The Langham offers unique dining experiences at Bistro Remy and the Palm Court. Bistro Remy is an elegant restaurant under the expert leadership of Executive Chef, Dave Whitting and serves an upscale neighborhood bistro menu of modern fare accompanied by some of Australia’s finest wines. Palm Court serves a traditional high afternoon tea of pastries, truffles and macarons and a selection of fine teas against a backdrop of stunning Western Harbor views. Palm Court transforms into a sophisticated lounge after sunset and serves an eclectic mix of signature cocktails with ambient lighting and live jazz. 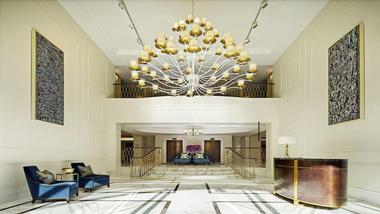 The Langham has a chic restaurant with modern European fare, as well as an elegant tearoom and cocktail bar, an exclusive high-end spa, and a fully equipped fitness center. A stunning 20m heated indoor swimming pool is surrounded by pale columns and covered by a star-dappled sky ceiling and a championship size hard-court tennis court is fitted with floodlights for night games. A fully-equipped health club features state-of-the-art cardio and strength equipment, as well as expert personalized trainers and relaxing steam rooms. The Day Spa by Chuan is a serene underground spa sanctuary that features 10 elegant treatment rooms and offers an array of indulgent massages, body treatments, skin care, and salon services. The Langham caters for private events ranging from weddings, fashion parades, to cocktail parties, to gala dinners and offers a range of beautiful venues and expert services to ensure every special occasion is nothing less than extraordinary.